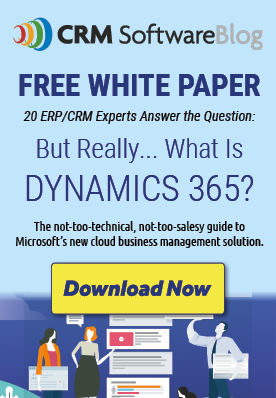 There are many out-of-the-box System Views and Dashboards that come with Dynamics 365. Many times, there are Views or Dashboards that go unused and are in a hindrance rather than a help. Other times, you may want to create your own custom System Views or Dashboards to replace the out-of-the-box ones. So, let's explore how you can accomplish these tasks. 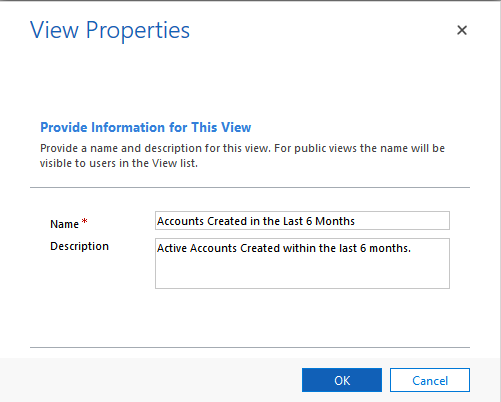 Removing a System View can be accomplished in a couple of methods depending on how you customize your Dynamics 365. If you use a Named Solution file in the Solutions area, then you will need to navigate to Settings>Solutions, and then click on the name of the solution file. If you use the Default Solution, then navigate to Settings>Customizations>Customize the System. Next, you need to expand the Entity in which you would like to manage the Views. We will be using the Account entity for the examples. Finally, click on "Views" to see the list of System Views. 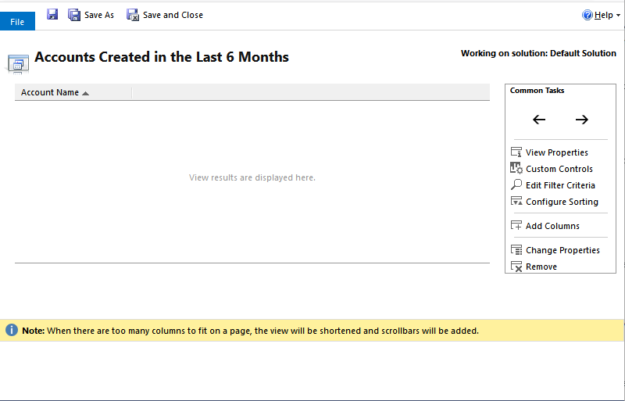 Now that you have accessed the System Views list, click the drop-down list at the top and select "Active Public Views". So, the next step is find the System View that you do not need and put a checkmark next to it. Lastly, click on the "More Actions" drop-down list and select "Deactivate". With the list deactivated, it will be removed from the Active System Views and placed in the Inactive System Views. Once you have deactivated all the System Views that you need to deactivate, click on the "Publish All Customizations" button at the top. 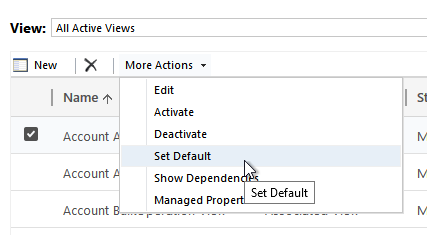 An additional option that you have is to set a default System View. While you have the System Views still shown, select a view and click the "More Actions" menu. Next, select "Set default". There may be time that you need to create a Custom System View. 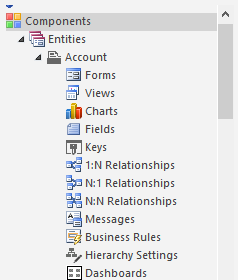 You may have configured the system with custom entities, or added custom fields. 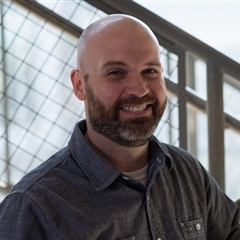 So, now, you need to create a Custom System View accommodate these system customizations. 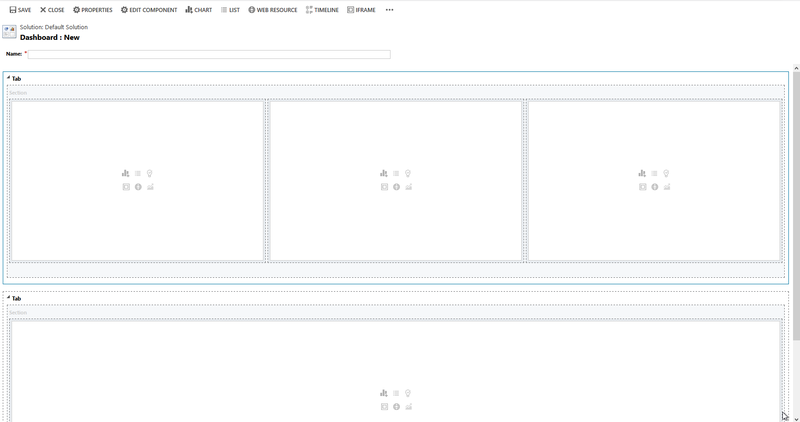 Creating a Custom System View is pretty straightforward. Click on the "New" button at the top of the System Views. You should now be presented with a window to give the View a Name and Description. After giving the view a Name and Description, click on "OK". You will now see a generic view that you can customize for your needs. So, you need to filter the view to meet your needs. For this example, I have added a couple of filters. Lastly, I added additional columns to the view to display more data. Once you are satisfied with your new custom View, simply click on "Save and Close", and then click on "Publish All Customizations". 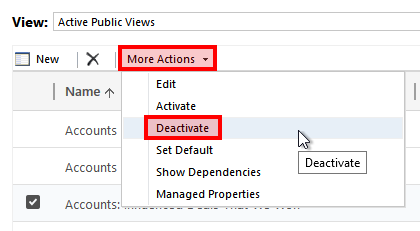 Unlike the System Views, the System Dashboards do not have a "Deactivate" option. The only options available for Dashboards are to delete the dashboard, or to remove access to the dashboard through Security Roles. Managing dashboards through Security Roles is my preference, but you may have different business needs and may need to delete the dashboard. First, navigate to the Dashboards list in the solution file. You should now see the System Dashboards listed on the right side. If you need to delete the dashboard, simply put a checkmark next the dashboard, and click on the "Delete" button. But, my preferred method is to remove access to the dashboard through the Security Roles. 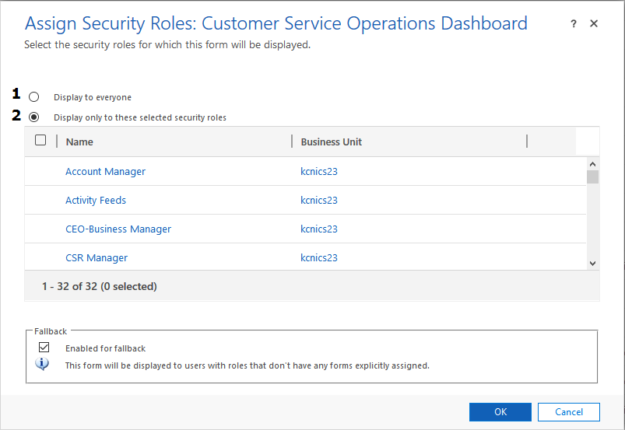 You can access this option by putting a checkmark next to the dashboard, and click on "Enable Security Roles". You should now see the list of your security roles, and two options at the top. The first option is "Display to everyone", and the second option is "Display to only these selected security roles". The "Display to everyone" option will do what it says and display the dashboard to all users in Dynamics 365. The other option will allow you to pick and choose certain security role. The trick here is to NOT pick any security roles. You will need to scroll through the list and make sure that there aren't any select. Once you have went through the list, click on "OK", and then select "Publish All Customizations". Setting a default dashboard is very simple. Since you have the dashboard list already open, select a dashboard that you would like as the default, and click on "Set as Default" at the top. So, this couldn't be any simpler. The only other step is to click on "Publish All Customizations". Before you can create a custom system dashboard, you need to choose from a few options. The first options are under the "New" menu. You can select "Dashboard" or "Interactive Dashboard". The "Dashboard" option is the classic dashboard, but the "Interactive Dashboard" is newer. The "Interactive Dashboard" option is only for the "hubs" are available under the Dynamics 365 menu. For our example, we will be creating a new "classic" dashboard the the "New" button. However, you should be aware of another option which is the "Save As" option (This is shown in the screenshot above). The "Save As" option will allow you to select a dashboard and make a copy of it. This option gives you a dashboard to that you can modify for you needs instead of creating one from scratch. After clicking the "New/Dashboard" option, you will be presented with a screen to choose a layout. 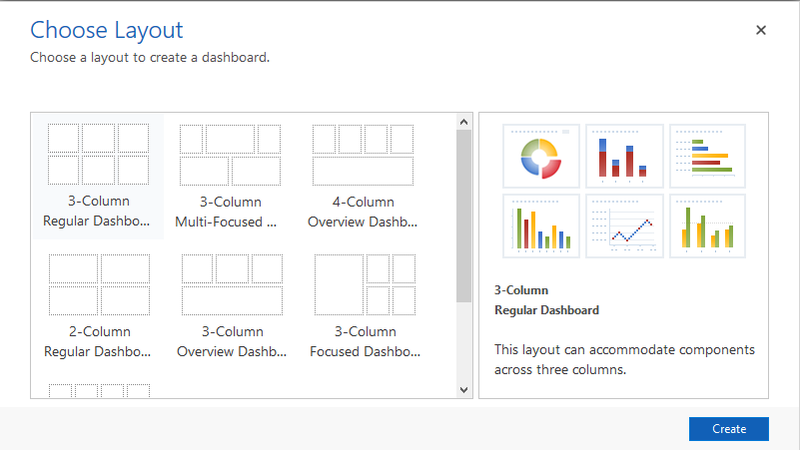 The new screen that appears will allow you to give the dashboard a Name and then add components. We will not be covering how build out the custom dashboard in this posting. This will be covered in a future posting. However, if you know how to create a Personal Dashboard, then creating a System Dashboard is the same. 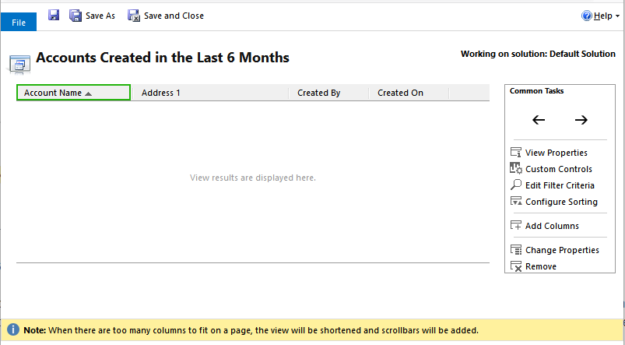 The only remaining step is the Save the dashboard and then click "Publish All Customizations. Hi Aaron, Need your advice please as I can not get an answer anywhere else. 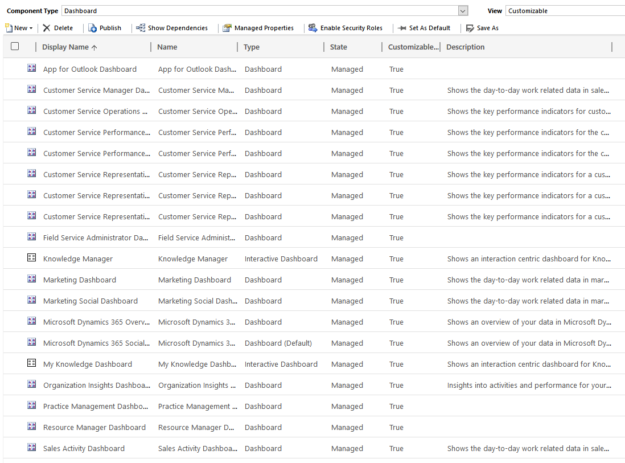 I have an issue were the Same Power BI Dashboard is appearing several times in My Dashboards selection list in Dynamics 365 CRM. 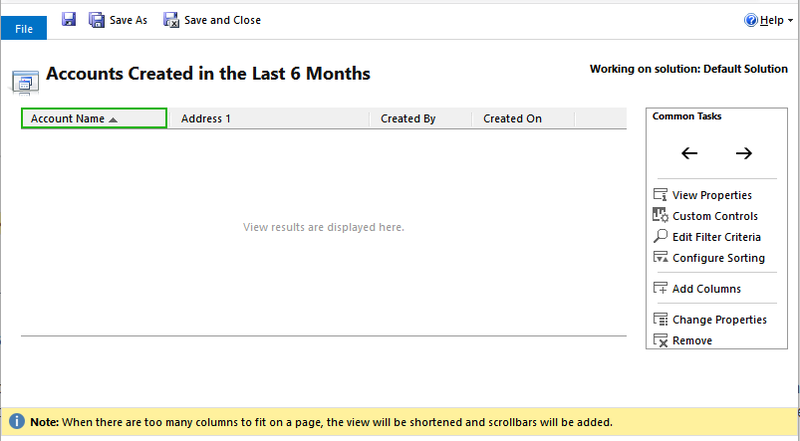 I have created a dashboard in an app workspace in PowerBI. I have shared this dashboard with users. The users have accessed the dashboard in their D365 CRM environment beautifully and with no problem. 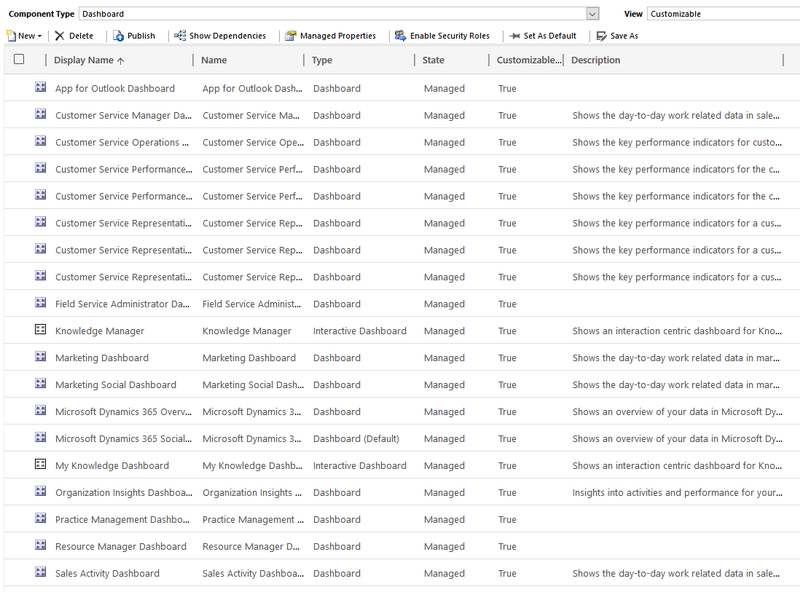 However, overnight the same dashboard now appears several times in the drop-down list of available dashboards in the My Dashboards list. The repeated dashboards cannot be deleted as a security error pops up when user attempts to delete these dashboards. I have checked dashboard security and sharing options in PowerBI and tested several different scenarios with no luck. Even as a sys admin I am unable to delete these dashboards on behalf of the user. 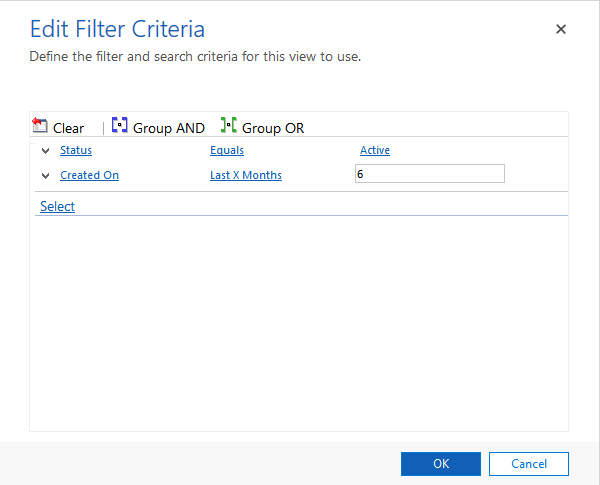 Do you know a method to delete a users My Dashboards in D365 CRM? SecLib::AccessCheckEx2 failed. Returned hr = -2147187962, ObjectId: 2f9c756b-23a1-e811-8198-e0071b659ec1, OwnerId: 631a3b67-f8b1-e711-815a-e0071b662bb1, OwnerIdType: 8 and CallingUser: 006e9c56-7797-e711-8127-70106fa12a51, CallerBusinessId: 42c98d4d-df86-e711-8154-e0071b662bb1. ObjectTypeCode: 1031, ObjectBusinessUnitId: 42c98d4d-df86-e711-8154-e0071b662bb1, AccessRights: DeleteAccess. Computed rightsToCheck=DeleteAccess, grantedRights=8, hsmGrantedRights=None, grantedRightsWithHsm=8. I am defaulting my dashboard with Set as default from Dashboards, but is showing my top alphabetically dashboard that is on the top (not the one I set default. There a couple of things to check: Did you publish your customizations? Also, did you refresh your browser after publishing?